To qualify in the shot-put at a middle school track meet you have to reach a minimum of 30 feet. Full Speed’s record is 16. Okay, so maybe not the shot-put. How about the 4 x 800 he helped run? Considering his team (which is categorized ‘B’ team for a reason) came in 12th out of 14, maybe this won’t be his event either. However, they did lap a team. Maybe there’s hope after all. But wait, the team they lapped consisted of elementary school kids. Looks like I just saved thousands of dollars in training fees. A young Full Speed realizing traveling by foot may be his least productive option. Now that T.Puzzle is a camoflauge belt, he technically is allowed to spar. This means I am technically allowed to be completely neurotic about it. 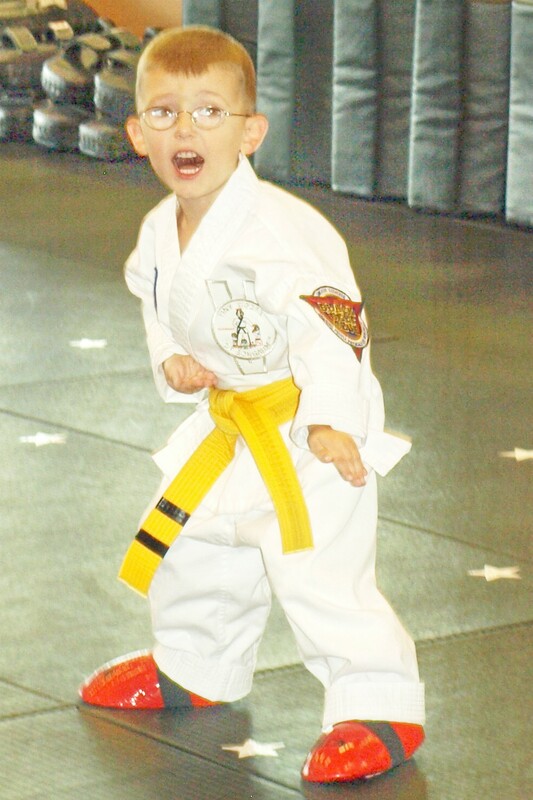 the good ol' days when T.Puzzle was still a non-sparring yellow belt. Oh, my denial runs deep. I keep wishing and hoping that his sparring days are far, far in the future. I went into this long explanation about how he has not, how I’m not ready for it, he’s too young, too timid and maybe Mad Dog can take him to a sparring class because I don’t want to see it. I think a simple ‘no, he has not’ would have sufficed. Needless to say, as soon as I’m done with my crazy little speech, the instructor approaches me and asks if T.Puzzle has his sparring gear. The more I thought about it the more I realized my concerns about T.Puzzle sparring had nothing to do with him. I am associating this with him being grown-up. Newsflash— he is growing up. Sometimes knowledge like this is worse than a flying high kick to the head. After it was over, it was all relatively harmless, and T.Puzzle shouted, ‘that was the most awesomest!’, I paused and tried to be grateful for how well he handled it. I still have a ways to go yet.